“The Hunger Games: Mockingjay – Part 1” mainly sets the table for the series’ conclusion, but it sets that table very, very well. It’s difficult to give a full review of The Hunger Games: Mockingjay – Part 1 mainly because by design it leaves its story incomplete. That said, director Francis Lawrence and the cast led by Jennifer Lawrence deliver a film that’s entertaining and continues to explore themes introduced in the first two films while being quite different structurally and tonally from the rest of the series. 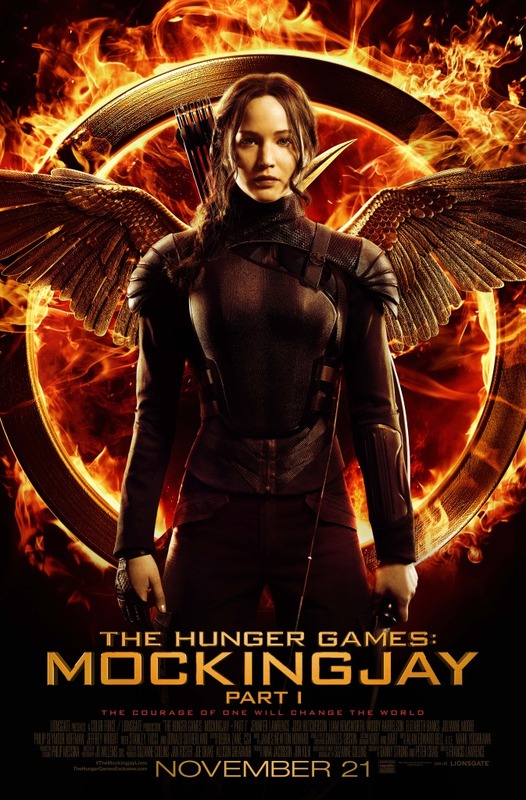 Mockingjay – Part 1 also provides audiences with a harrowing cliffhanger ending that’s sure to have them eager for the concluding chapter coming to theaters next year, a conclusion that promises to render up all the action that Part 1 so deftly sets up. Part 1 of Mockingjay begins with one-time Hunger Games District 12 tribute and victor Katniss Everdeen (Jennifer Lawrence) struggling to hold on to her sense of self after she’s learned that the world she knew before the games has been bombed into oblivion. Her explosive act of defiance at the climax of the previous film brought about swift reprisal from the tyrannical President Snow (Donald Sutherland), who ordered District 12 and its inhabitants eradicated as a show of force to dissuade any of the other districts from further acts of rebellion. Thanks to the efforts of Gamemaker Plutarch Heavensbee (Philip Seymour Hoffman), Haymitch Abernathy (Woody Harrelson) and Katniss’s childhood friend and hunting partner Gale Hawthorne (Liam Hemsworth), Katniss was retrieved from the arena and rescued at the same time her mother and sister Prim (Willow Shields) were evacuated from 12 and saved. They’re all brought to a vast, underground complex that is the home of District 13, the district all the others were told was completely destroyed the last time a rebellion against the Capitol occurred 75 years before, and it’s not long before Plutarch and District 13’s leader President Coin (Julianne Moore) ask Katniss to be the rebellion’s propaganda symbol, their “Mockingjay”, in order to help incite further rebellion against Snow. Headstrong as ever, uninterested in being used as a symbol any longer, and still angry at Plutarch and Haymitch for rescuing her rather than Peeta Mellark (Josh Hutcherson), her fellow District 12 tribute with whom she’d finally allowed herself to truly fall in love with, Katniss refuses. But when Snow begins to use Peeta as the Capitol’s propaganda symbol against the rebellion, she finds she has little choice but to be what Plutarch and Coin need her to be. 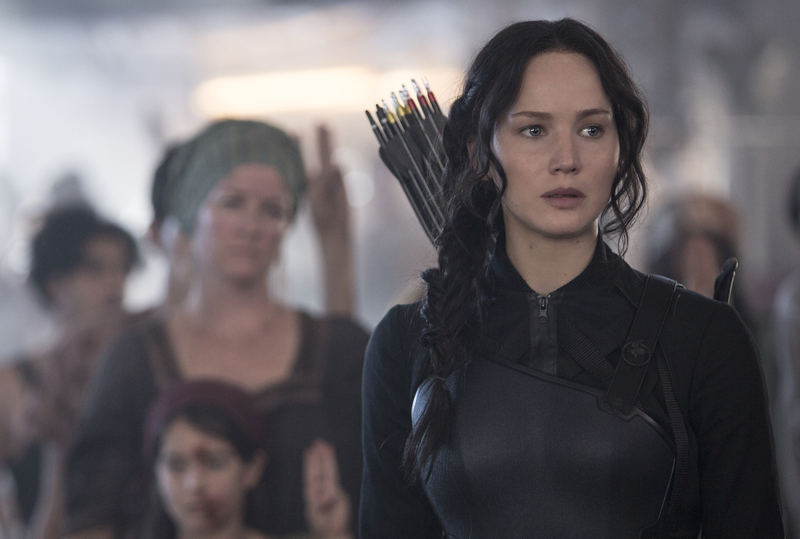 With a camera crew behind her and Gale at her side, Katniss becomes the star of District 13’s propaganda war against Snow, a war waged with images of the firebombed ruins of District 12, the hard lives of those in other districts who choose to defy the Capitol, and of the Mockingjay vowing to fight Snow’s repression to her last breath. But neither Katniss nor the rebels truly grasp yet just how far Snow is willing to go to restore the status quo, or what other weapons he’ll bring to bear to crush their hearts and spirits. As the war escalates and each side takes greater risks, the full measure of his resolve and his cruelty becomes clear, and the question becomes just how much is Katniss prepared to lose in order to win this one final contest of survival. Francis Lawrence, who took over the task of guiding Suzanne Collins’ The Hunger Games novels from the page to the screen in the last installment, The Hunger Games: Catching Fire, faces a very unique challenge in his effort to bring Mockingjay to cinematic life. This book, the third and final novel in Collins’ series, is considered by some fans to be the weakest of the series, and arguably a reason for that weakness is the absence of the Games themselves to build up to structurally and to provide escalating suspense and greater physical as well as mental and emotional challenges for the characters. Obviously, Lawrence and his cast face the same issue in adapting the material, but the idea to split the novel’s story into two parts is actually a good one and suits Mockingjay far better than the prior two novels because it doesn’t have another “Hunger Games” set in an arena that might need to be split into separate parts for separate films. It also provides the opportunity to further develop characters introduced in Mockingjay and expand the roles of established characters in the plot in order to give them meatier parts to play in the series’ denouement. In essence, because some fans of the series think the least of this entry in book form, the opportunity exists for the film version to exceed expectations and deliver a superior entertainment experience much more so here than it did for the previous films. Whether or not they do so successfully remains to be seen, but cast and crew certainly give their all, and though it’s highly cerebral and light on action for its 123-minute running time, there’s no lack of enjoyment to be found here. Screenwriters Danny Strong (Game Change, The Butler) and Peter Craig put Katniss and company through the ringer as they wage war not only against President Snow and his Capitol, but also against fear itself, within themselves and within the people of Panem. For a society that’s been beaten into submission for decades, turning the tide against fear and despair does not happen overnight, and the script honors what that struggle realistically might be like, with hope being as precarious as a flicker of flame in the wind, and the smallest of gestures made by the right person being more powerful than the slickest of propaganda pieces and political rhetoric. As for the cast themselves, they inhabit these familiar characters precisely the way we expect them to at this point, and that’s to their credit. What’s more interesting at this point to take note of is the contributions of the new members of the cast: Julianne Moore is a welcome addition, playing President Coin as a leader and a politician hardened by her experiences, her losses, and the continued burden of protecting the surviving citizens of District 13. Also, English actress Natalie Dormer, who fanboys and fangirls will certainly recognize from her appearances in “Game of Thrones” and Captain America: The First Avenger, brings a memorable presence to the series as Cressida, the director who along with her camera crew shoots the rebellion’s “propos” (propaganda pieces). While the role is a relatively small one in this portion of the story, Dormer gets just enough to do and does just enough with it to make you hope she gets more development in the final film. All that said, yes, The Hunger Games: Mockingjay – Part 1 is for the most part just setup for what should be a thrilling conclusion to the saga. But it’s definitely must-see setup; it’s a solid and savvy entry in the series, and should effectively fan the flames of expectation for what comes next. Starring Jennifer Lawrence, Josh Hutcherson, Liam Hemsworth, Woody Harrelson, Elizabeth Banks, Julianne Moore, Philip Seymour Hoffman, Jeffrey Wright, Stanley Tucci and Donald Sutherland. Directed by Francis Lawrence. Rated PG-13 for intense sequences of violence and action, some disturbing images and thematic material.